Our approach was to create public and private areas of common use, which together form the social, cultural center of Gomba, reflecting the demands of inhabitants not only functionally but also aesthetically. 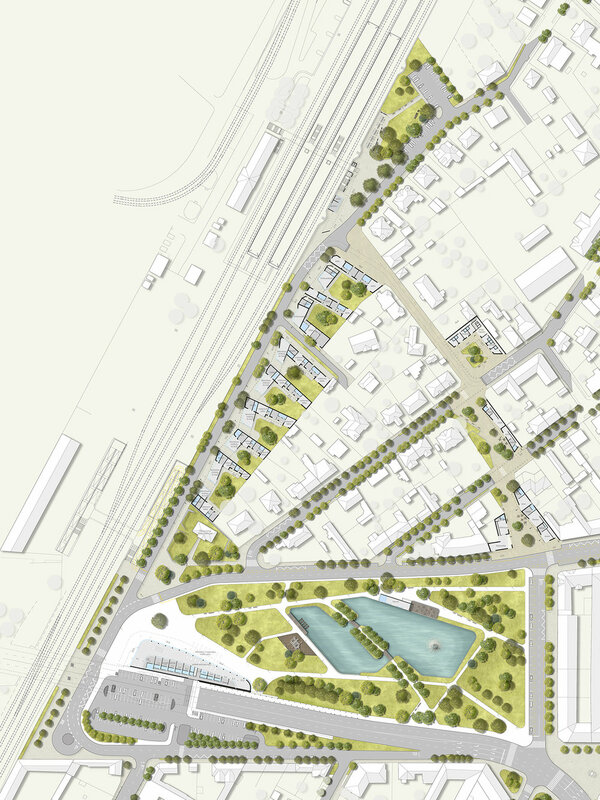 By renewing the area, it is possible to create a dignified environment for the distinctive heritage buildings of the settlement, and to create a public open space for inhabitants and visitors alike. In addition to being a stage for mondain activities, it can also become the heart of community and social life, thus creating an emotional bond, a sense of identity to the village. The construction phase documentation was completed in 2012 for Szemők Balázs Square, a priority area within this space, its construction is already completed on the basis of the plans. When designing this newly built space, it was essential to make it an organic part of the village and provide an aesthetically pleasing space for new functions. According to our aims, Szemők Balázs Square - leaning up against a three-sided aesthetic post-reconstruction spatial wall - is used and loved by all age groups of the settlement. As an extension to the 1st phase of Millenáris Park, we aimed to create a complementary space with functions still absent in the park or in its surroundings: - functions that target the local community. We have retained the existing hall buildings to match the previous phase and we came up with solutions that fit well with, and even make use of the possibilities such large open spaces provide. We proposed the installation of indoor swimming pools and wellness features on the massive ground floor of building block M, since these facilities are currently unavailable in such proximity to any other intermodal node in Budapest. On the first floor we imagined the first community office of Buda, an incubator for the creative industry. The park expansion becomes an integral part of the already complete unit in terms of style and design. 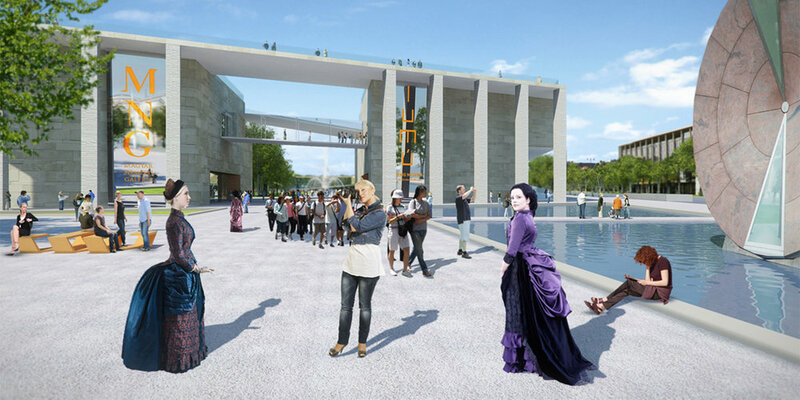 We imagined a lake in front of block M, which generates captivating reflections in front of the glazed facade. Between block M and the Margit Boulevard, lawn surfaces rise towards the building, thus attenuating traffic noise of the boulevard. At the starting point of Millenáris Park's main axis, we designed a space where the dynamic sight of wind-driven flags always attracts the attention of passers-by, thus becoming a worthy gate, entrance to the park. Host: Millenáris Széllkapu Nonprofit Kft. 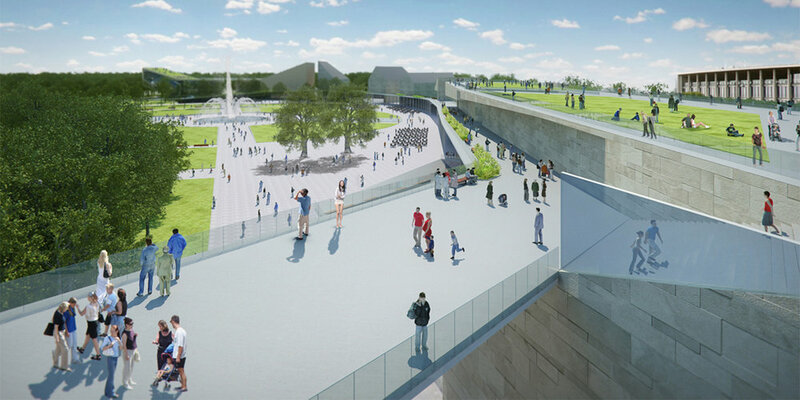 During the design process, we strived to highlight the uniqueness and virtue of the site without compromising the integrity of remembrance. With the redesign of the area, the cemetery can not only serve a public service function, but also play an aesthetic and physiological role in the life of visitors and inhabitants. Our primary goal in expanding and renovating the cemetery was to create a contemporary, well-functioning system in line with existing practices. The end result is a unified, representative setting that provides a worthy environment for remembrance. We considered it essential that existing elements such as the building and the green space stay integral parts of the design. Applying transparency and purity to functions that make registration, reservation and everyday use easier, were key features of our methodology. We used seating, fixtures and materials that fit into the cemetery's ambience, provide a consistent image and are able to serve the habits of visitors and maintainers alike. 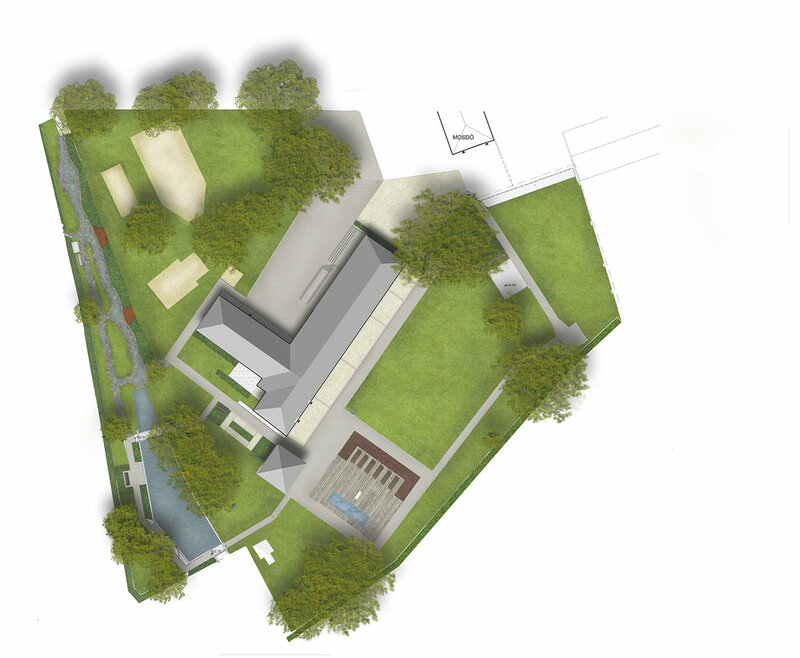 For Dabas Jubilee Park, our approach was to create a verdant space of fundamentally recreational use. During the design process, we maintained the currently well-functioning surfaces while we also reflected on the potentials of the park. 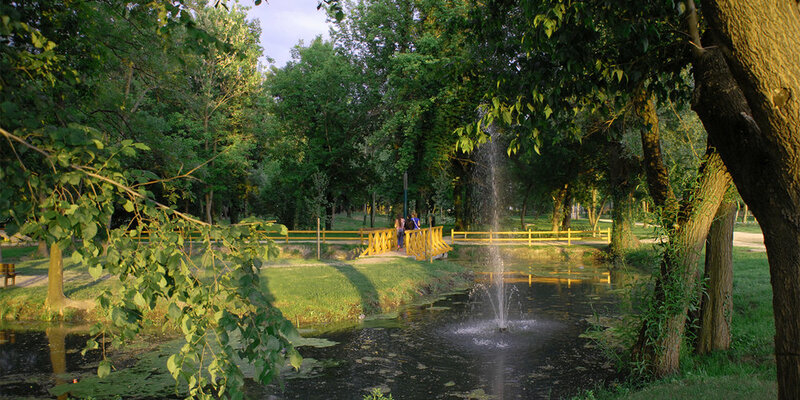 The ambience of the park simulates a landscape forest. 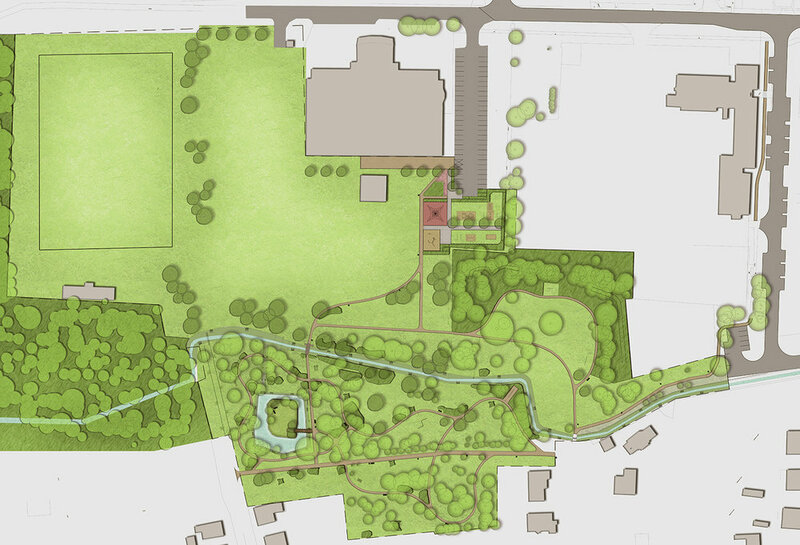 We focused on preserving the natural atmosphere of the current site, while maintaining the width of the forest walkway. The park was divided into five units according to functions. The large grassy meadow provides space for events and the horse riding area. Loose groups of trees have been planted in the meadow, while the remaining lawn surface can be used as a playground. The existing playground was reinvented, as new play furniture for larger age groups was added as an extension. In the vicinity of the Hundred Year-Old Tree, vegetation is revitalized; it is also our proposal to build an adventure track over time on the older trees. By ensuring the water supply of Lake Körtó and the cleaning of the riverbed, we created a cozy, attractive resting area that is connected to the island with a new bridge. The revitalization and rehabilitation of the herbaceous meadows, the installation of new trees results in a pleasant, well-groomed landscape. The area is exposed by a network of pedestrian footpaths equipped with benches and forest sports equipment. As part of our concept, the free-formed yet guided lines of the main square are gradually calmed as we arrive to the grand mass of the church. Behind the church, a sport promenade creates connection to the main square. Sculptures of renowned athletes placed alongside the promenade accompany the passer-by, as a reminder of past encounters, perseverance and successes. The diagonal axis is represented by a walkway that leads to a gate, surrounded by an imposing arrangement of buildings. 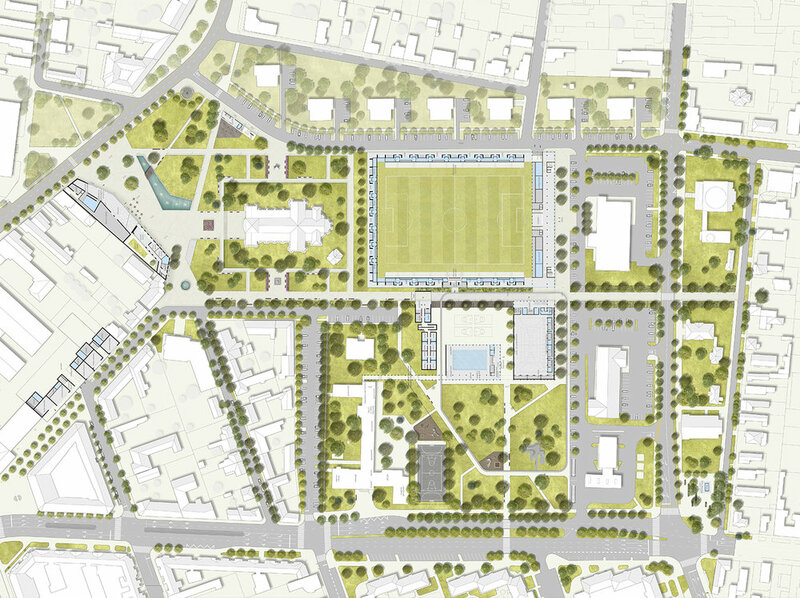 The natatorium and the sports center frame an inner outdoor piazza with several sports fields. There is a colonnade guiding the piazza along its 4th side, adjacent to the football pitch. The repetitive structure of the seating area contains toilets and kiosks, both indispensable elements of football stadiums. The VIP area can be optionally extended in the future, the shared lounge area opens directly from the sport piazza. The frame structure currently expands above the seating area, but can be extended or modified at any further phase of construction. The changing and maintenance rooms are located inside the stadium’s head building, which also houses a wellness-fitness center as part of a complex spatial network. For the match to go undisturbed, the stadium has a solid façade on ground level, while the upper corridor – also serving as a viewing gallery – has a glazed one. 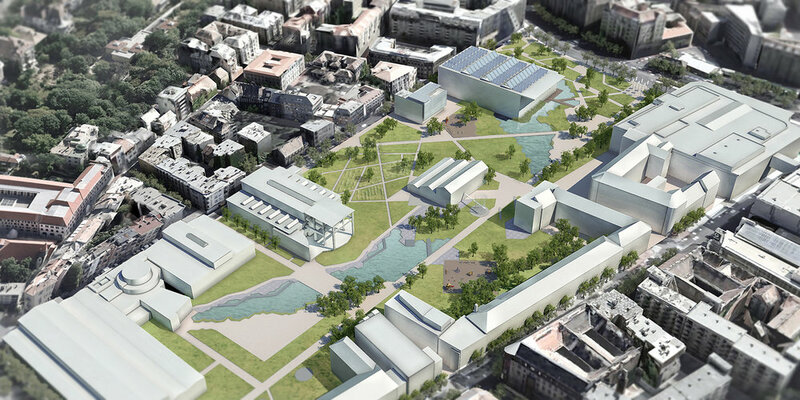 The natatorium communicates with glazed walls to both sides, allowing an open view to the inner sports piazza and the outer park. The school is linked to this sports complex through a covered corridor. As it is not advised to block diagonal passage on ground level, this connecting corridor rises above – stands on its own feet shortly after exiting the building. Czabán Samu park is intensely linked to the functions of the sports complex - running tracks, extreme sports fields, climbing walls, trampolines, and pools are at the disposal of local sports enthusiasts. The promenade linking the units of the sports complex ends by the corner of the church where the new community hall and playhouse are being constructed. This hall will provide space for residential discussions, and potentially become a landmark of local cooperation and unity. a park that can only be imagined in Budapest, a unique and remarkable tourist attraction. installing furniture reflective to the surrounding space.